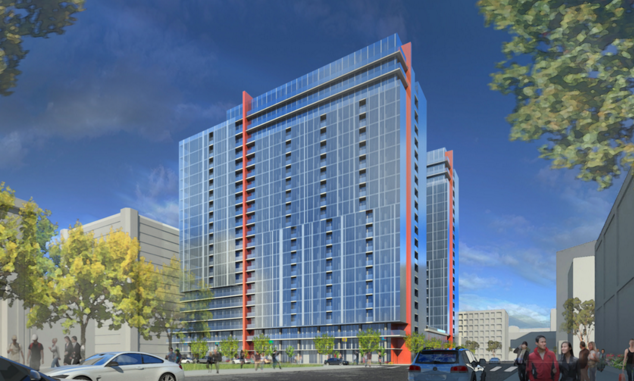 The San Jose Blog: Two More High-Rises Planned for Downtown San Jose! Two More High-Rises Planned for Downtown San Jose! So many high-rise projects are coming into the pipeline for Downtown San Jose that they are now being proposed two-towers at a time. 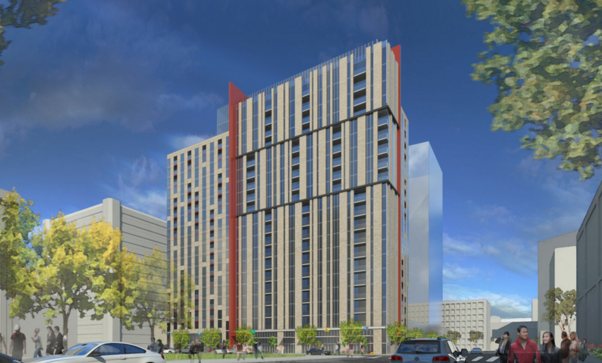 This latest proposal would be the largest residential project in Downtown San Jose's history, clocking in at 708 units! The two towers would be built by KT Urban, which is the company behind Axis and One South Market--arguably the two nicest looking residential towers in Downtown San Jose. They were also involved in the 643-unit Silvery Towers complex that is now under construction by the San Pedro Square Market. If anyone has the ability to get high-rise projects moving forward in Downtown San Jose, it's these guys. Based on the SVBJ article, they are proposing a 24-story (251 ft) and a 23-story (241 ft) tower sitting on top of three levels of underground parking. One tower would have 414 units while the other would have 294 units. The ground floor would have as much as 13,500 SQFT of retail primarily on Post Street. The project would be built on 1.6 acres at 70 S. Almaden Avenue. Currently the only thing on this lot is a dilapidated Greyhound bus station and a parking lot. 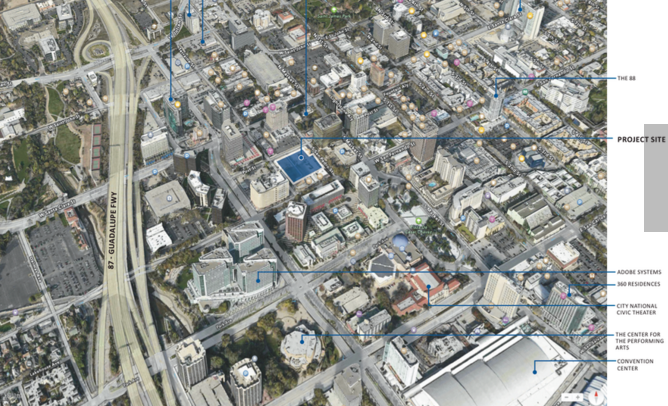 The location is very central in Downtown San Jose as you can see in the map below. The bulk of Downtown's amenities are located within a five block radius. I also like how Nathan Donato-Weinstein gave a shot out to Mark Haney from Think Bigger San Jose in the article. Mark has already updated his awesome high-rise map with the new project. There is no doubting Downtown San Jose's momentum at this point.